The New York Times just published a fine article about the dilemma facing Portugal that a collection of the famed Portuguese poet Fernando Pessoa’s papers might be sold and leave the country. What drew me to the article was the fact that it was on Pessoa, for whose work I have a great appreciation, but what brings me to write about the article here is of course the stencil graffiti illustration used in the piece and its larger significance. I remember seeing this stencil the last time I was in Lisbon. It made a great impression on me then for the same reasons that bring me to write about it now, but the fact that it is the illustration for this particular article brings it to a new light. 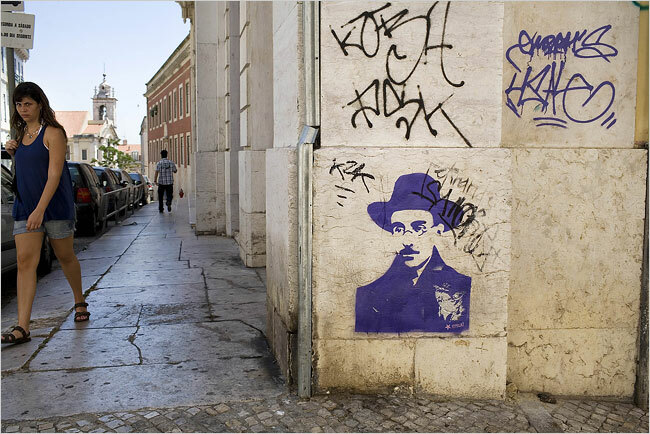 There is a quality in Pessoa’s image being painted on the streets of Lisbon that anchors him to the city in a tactile, visceral way – the same way that he himself is so strongly anchored to the city. He was born in Lisbon in 1888, and lived there for most of life, a virtually unknown writer publishing little of his immense body of work before ultimately dying there in obscurity in 1935. Certain authors have always had an inseparable connection to specific cities. I think of Miller’s writings of Paris, or Hemingway’s fondness for Madrid, and of course Kafka’s embodiment of Prague. To think of these authors and their respective cities is to imagine their image cast against the physical streets of the city. In Lisbon, someone has literally done just that, and The Times acknowledges this testimony of individual action with their illustration. As always, I find much larger meaning within this intervention than what is seen the surface. Let’s frame this stencil in the perspective of creating a public tribute to Pessoa in his home city. Imagine the individual who created this stencil decided that he was going to petition the city to create a new public monument to the poet apart from the rather uninspiring one which exists in front of A Brasileira. First, of course – would they have access to the city officials to get the proposal, or letter, even past the first filter given to public correspondence? And, if so, then think of the immense amount of bureaucracy, competitions, commissions… we are now looking at several years of process. And even in an alternate take – if the individual petitioned the local authorities with the desire that not only a public portrait be created, but that the artist put themselves forward as the one that would then create it? Mega-million lotteries hold better odds. So, instead, in the course of a few hours, the stencil was made, and, most likely, in a few seconds in the middle of the night, the tribute was created – by the people, for the people in a direct creative action. No permissions, no commissions, no waiting. But what is more, the image itself holds a tragic beauty beyond that of Pessoa himself which resonates with Lisbon. One of my favourite cities by far, Lisbon holds a beautiful if at times sad reminder of its past empirical grandeur. This is found within the portrait of Pessoa himself – his immaculate, stately attire, taken so much for granted at the time, but now a symbol for a past prominence in himself, in his home city, that is more reminder than reality. Of course Lisbon has found a new confidence in recent years, a renewed vitality that brings the warmth, romance and brilliance it holds within the beauty of its stone-filled city to the surface. And in the stenciled portrait of Pessoa, I find that hope of renewal as well. His gaze looks literally to the street itself, in contemplation. In anticipation. A staggering beautiful tribute to Pessoa, done fitting tribute by The Times. very pleased to know that the pictured inspired your thoughts to this great post. Myself I was very happy that this images was chosen as an opener. I am the author of the stencil. Someone just send me this post of yours. Thank you! Loved your words and thoughts.